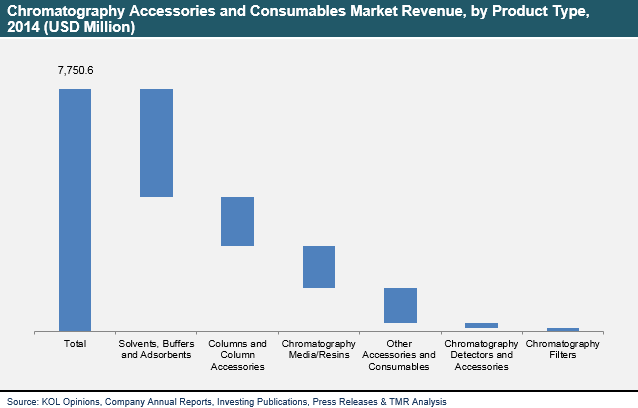 According to a new market report published by Transparency Market Research “Chromatography Accessories and Consumables Market - Global Industry Analysis, Size, Share, Growth, Trends and Forecast 2015 - 2023” the global chromatography accessories and consumables market was valued at USD 7.8 billion in 2014 and is expected to grow at a CAGR of 7.5% from 2015 to 2023, to reach an estimated value of USD 15.0 billion in 2023. Chromatography is the most widely used technique for separation of mixtures. The developments over these years in the field of analytical technology has eventually increased the accuracy and precision of chromatography techniques. In the current times, there is a surging demand for innovative products in the market as well as the improvised versions of existing products in the health care industry. Clinical research becomes the backbone and laboratory equipment become the tools to transcend these goals into reality. Chromatography accessories and consumables fall under this category with the capacity to transform the health care market. Chromatography accessories and consumables constitute instruments and laboratory equipment which together complement chromatography systems. The report offers interesting insights exploring the tremendous potential of chromatography consumables and accessories on account of its wide range of ever increasing industrial applications. Solvents, buffers and adsorbents segment is generating the highest overall revenues compared to the other product segments and will continue to enjoy its dominant position throughout the forecast period growing at a CAGR of 8.6%. In addition, there is an in-depth segment wise analysis backed by growth trends projected for the forecast period from 2015 to 2023. Some of the special highlights of this report include an exhaustive review of the market players and the key factors driving their growth, backed by numerous evidences. The report further provides a detailed analysis of the current as well as emerging technologies in chromatography equipment, and its potential applications for various industries. The end user segment includes food and agriculture which is proposed to rise at 7.1% CAGR. Rising demand for high quality active pharmaceutical ingredients (APIs) is assisting the market growth of chromatography consumables in pharmaceutical industry that accounts for the largest share of 34.4% in the total market. On a global scale, rising demand for technologically advanced and innovative products in pathology lab testing is expected to be a precursor for growth in this market during the forecast period. The report aims to unravel the novel business strategies of the companies who are leading the market of chromatography accessories and consumables on a global scale. The geographical segmentation of the market include: North America that accounted for largest share i.e. 40.2% of the global market in 2014; whereas Europe chromatography accessories and consumables market is expected to register 6.9% CAGR during the forecast period from 2015 to 2023. Interestingly, the trend is picking up at the fastest pace in Asia Pacific especially in countries like India, and China. Due to higher growth in the end users market, this region offers the best pool of opportunities among all other regions with respect to the chromatography accessories and consumables market. The major players operating in the global market include Agilent Technologies, Inc., Bio-Rad Laboratories, Inc., GE Healthcare, EMD Millipore, Pall Corporation, PerkinElmer, Inc., Phenomenex, Thermo Fisher Scientific, Inc., Shimadzu Corporation, Sigma-Aldrich Corporation, Tosoh Corporation, and Waters Corporation. In terms of revenue, it was observed that Waters Corporation held the largest share of the global chromatography accessories and consumables market in 2013. Most of these players continuously innovate by developing new products and improvise existing ones to keep pace with technological advances in order to maintain their position in the global market.